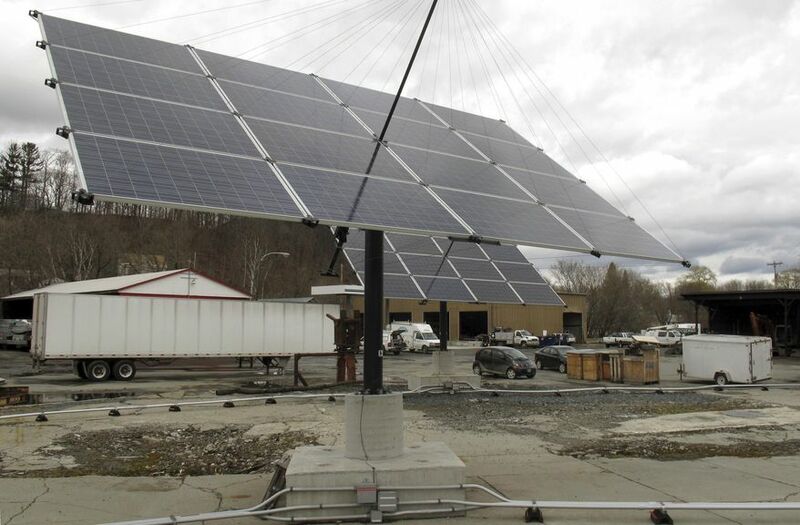 NORWICH, Vt. (AP) - The Vermont town of Norwich is now the first community in the state where all municipal buildings get their electricity from the sun through a deal with a local solar provider that sends more power from the sun onto the electric grid than is used in town buildings. The deal is expected to save the town of about 3,500 about $2,000 on its $20,000 annual electric bill for the Town Hall, police and fire station, public works facilities and even the speed limit signs that are spread through the community on the west bank of the Connecticut River just north of White River Junction. But the financial savings is only a part of the reason the town signed the deal with Solaflect Energy that cost the community no money out of pocket: Norwich is trying to do its part in helping Vermont meet the long-term goal of getting 90 percent of the state’s energy from renewable sources by 2050, said Linda Gray, the chairwoman of the town Energy Committee. “We are going to do our best to make a contribution to these statewide goals,” said Gray. What’s happening in Norwich is part of a broader effort by many in Vermont, across the country and the world to find alternative, renewable ways to produce electricity. “Community leadership by example is an important component to meeting Vermont’s renewable energy goals,” said Darren Springer, the deputy commissioner of the Vermont Department of Public Service, which sets energy policy for the state. “When a town powers its municipal buildings with renewable energy, they not only can reduce greenhouse gas emissions and help reduce taxpayer energy costs, they demonstrate the value of clean energy technologies to the broader public,” Springer said. Like most solar projects, the town reaching the 100 percent threshold does not mean those buildings are wired directly from the solar panels that make the electricity when the sun shines. Rather, the town commissioned Solaflect to erect enough solar panels that will feed power onto the regional electric grid to offset the amount that is used by the municipal buildings. The buildings are still attached to the regional electric grid and when the sun isn’t shining they get power from other sources. However, the amount put onto the grid exceeds the amount the town uses. The town signed the deal with Solaflect in the fall of 2013. The last panels, located in Lunenburg, went online late last year. More panels are located in an industrial section of White River Junction. The deal cost the town no money out of pocket. Solaflect arranged the financing with help of solar tax credits and the guarantee the town would continue to buy the power. “The thing with solar compared to say fossil fuels, is solar is all an up-front capital investment and then the operating cost is very minimal and the fuel cost is free,” said Solaflect President Bill Bender. Norwich and Solaflect emphasize they are not selling the renewable energy credits from their projects, as happens with some renewable projects. Credits can be sold by the firms that produce the electricity from renewable sources such as solar to utilities with few renewable assets of their own so that the utility can claim that an equivalent amount of the power it sells comes from renewable sources. Bender says the credits can be worth up to 25 percent of the cost of the project. “The key is it’s just truly 100 percent solar,” Bender said of the project. Gray said keeping the credits was important to the town.